Price from: $1395 - Book now! Welcome to Phnom Penh, Cambodia’s vibrant and bustling capital city. Despite its recent turbulent history, Phnom Penh’s wide tree-lined boulevards and faded colonial mansions hold an undeniable charm. Upon arrival, our guide will meet you at the airport and take you to your hotel. Enjoy some free time to rest and freshen up before driving to the dock to catch an evening boat cruise along the Mekong River. Savor a welcome dinner onboard as you watch the sunset over the shimmering lights of Phnom Penh. 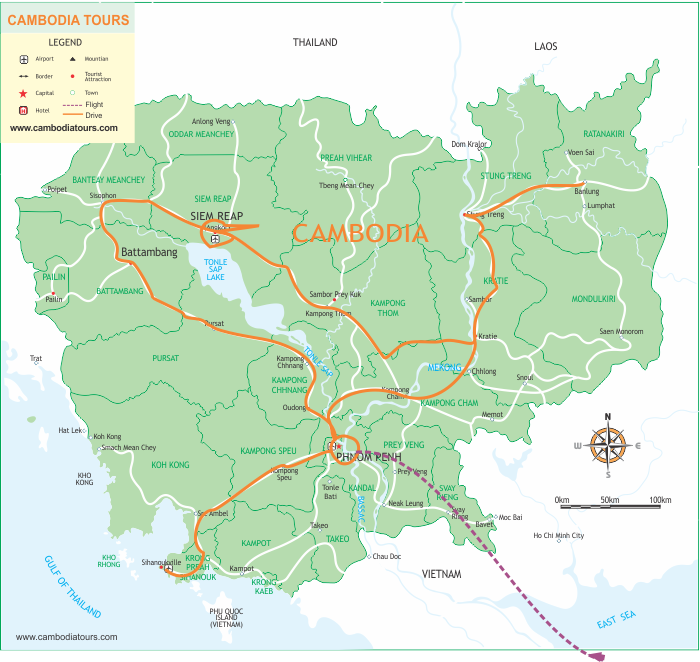 Today we travel by car to Battambang, Cambodia’s second largest city. Get a taste for Cambodia’s rural life and stop en route at Kompong Chnang to visit the floating village in Kompong Luong. We arrive in Battambang in the afternoon. Check in at your hotel then enjoy an orienting walking tour through the city’s bustling boulevards lined with quaint French colonial buildings. Next visit some of Battambang’s signature hilltop temples as well as the infamous cave, Phnom Sampov, used as an execution field under the Khmer Rouge. Today we drive from Battambang to Siem Reap, the provincial capital and gateway to the ancient Angkor Temples. Designated a World Heritage Site by UNESCO, the Angkor Archaeological Park encompasses dozens of temple ruins including Bayon, Banteay Srei and the legendary Angkor Wat. Spend 3 hours driving through Cambodia’s charming countryside, past stretches of rice paddies and exotic hamlets. Arrive at Siem Reap and check in at the hotel. In the afternoon, we drive to the Archeological Park to visit the magnificence of Angkor Wat - the largest Khmer temple and finest example of Angkorian art and architecture. Enjoy breakfast at your hotel and travel in the morning to Koh Ker. Here we will discover the long abandoned temples in the forests of northern Cambodia. Also known as Chok Gargyar, this region once served as the capital of Jayavarman IV until his son and successor, Harshavarman I moved the capital back to Angkor. There are more than 30 major structures and archeologists believe there may have been as many as 100 minor sacred buildings in the region. In the afternoon, drive back to Siem Reap, stopping en route to visit the remote and jungle-covered Beng Mealea temple. Today is dedicated to exploring Cambodia’s daily life and rich culture with trips to Kampong Khleang and the floating villages on Tonle Sap Lake. Travel down winding picturesque roads on the way to Tonle Sap, stopping to admire the rice plantations and various season activities of the locals such as roof building and banana harvesting. Board a boat and visit the floating village before heading to the nearby flooded mangrove forests. In the afternoon we drive to Kampong Khleang homestay. Take a cooking class on traditional Khmer cuisine before joining with a local family for a cozy homestay. Say good bye to your host family then set out on a drive to Kampong Thom (130km, 2 hours drive), home to Cambodia’s most impressive group of pre-Angkorian monuments. Here we will visit the ancient temple complex, Sambor Prei Kuk, situated just north of Kampong Thom. The main temples are divided into three complexes, all dedicated to Shiva. Enjoy the serene atmosphere as you wander through these 7th century brick monuments, artfully scattered about the jungle. Return to the town of Kampong Thom in the afternoon and proceed to hotel in center. After breakfast at hotel, the guide and driver will transfer you to Mondulkiri Project where you will join in a fun day in the jungle with Mondulkiri elephants in the protected forest. Here you have chance to live with elephant for a day, and do many activities, such as: feeding and following 4 Mondulkiri elephants through the jungle (no elephant riding), swimming with and washing elephants at the waterfall, learning about elephants and Bunong culture and traditions. Have lunch at the Jungle Lodge and relaxing in hammocks. The Lodge has great views over the jungle and is a good place to view wildlife and many species of birds. Have breakfast at the hotel then travel by private car with to Sihanouk Ville (226km with 3-hour drive). Sihanouk Ville’s white-sand beaches are some of the most pristine in all of Southeast Asia. 10 km of beach stretches the whole length of the town and with dozens of small islands just a short boat ride away, Sihanouk Ville makes for the perfect tropical getaway - complete with facilities for swimming, snorkeling and scuba diving. Upon arrival, you check in at the hotel then free to enjoy the afternoon at your leisure. Soak up the sun as you lounge on the beach or enjoy swimming and snorkeling in the warm waters of the Gulf of Thailand. Accommodations: Hotel in Sihanouk Ville. This is private tour so the itineraries and hotel selection are very flexible. We have just sent you the detail program with 4 and 5 star accommodation via your email. Please check it.